St. Kassiani, best known for her hymnography, became a nun and founded a monastery in Constantinople at a young age. Not much is documented about her later life, and it is assumed by scholars that she reposed in her monastery in Constantinople, but there is a tradition that says she traveled to Italy with another nun named Evdokia, perhaps to flee Emperor Theophilos, who had sought her hand in marriage before she became a nun and kept in contact with her afterward. From there she went to Crete, and then to the island of Kasos near Crete, where she reposed on September 7th around 890 AD. Her body was placed in a marble coffin and eventually a chapel dedicated to her was built over this. 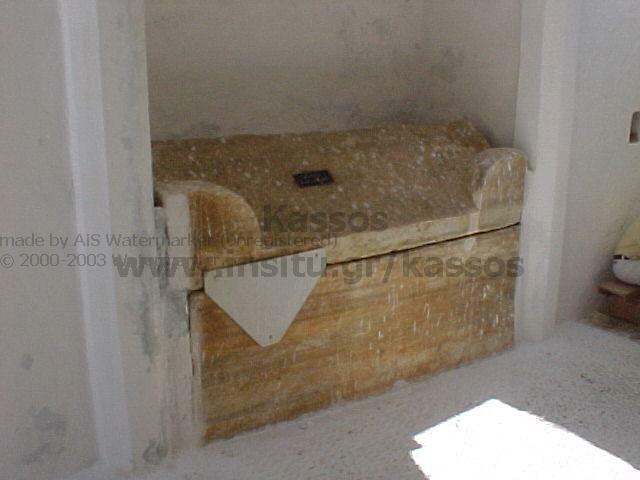 This 9th century coffin survives today in Kasos together with a plaque from that time indicating the year of Kassiani's death with a cross. According to local tradition, the marble coffin no longer contains the relics of St. Kassiani, which at one point were transferred to the island of Icarus. Whether this is St. Kassiani the Hymnographer is up for debate, depending on whether or not one is willing to take this tradition into consideration. It could be argued that the Kassiani indicated in Kasos merely indicates a holy female who was born or lived in Kasos, since a female resident of Kasos would be known as a "Kassiani" while a male resident would be known as a "Kassianos". The only other local St. Kassiani we know about in the area was the sister of St. Eutychianos, who lived in asceticism in Kefali near Martsalo in Crete. There may be a connection or even a confusion of these two Kassiani's, but this requires further study. Till then, the association between St. Kassiani the Hymnographer and Kasos should not be ignored. * This hymn is chanted on Holy Tuesday evening in anticipation of Holy Wednesday.